One minute you’re driving down the road. The next second–boom!–you’ve found yourself in a car accident. Traffic accidents can be a pretty frightening experience, no matter how minor or major the incident may be. 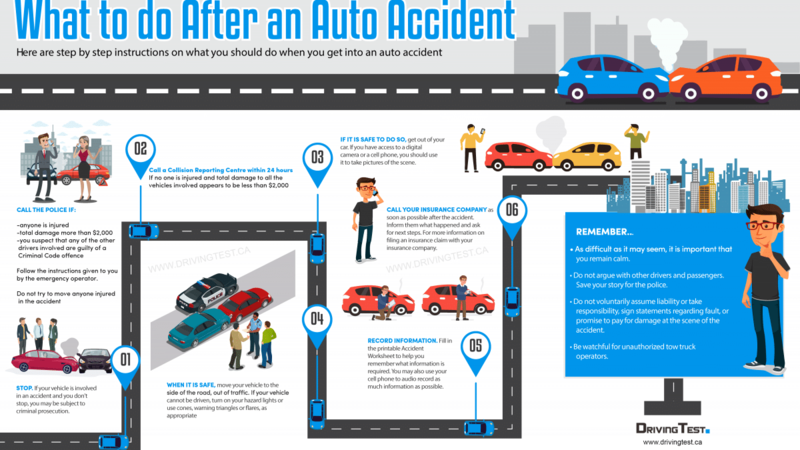 If you’ve never been in a car accident before, you might find yourself at a loss of what to do. The first thought that goes through your mind is probably, Thank goodness I’m alive. The second thought, What do I do now? With emotions so high, it can be difficult to think clearly at the scene of an auto accident. 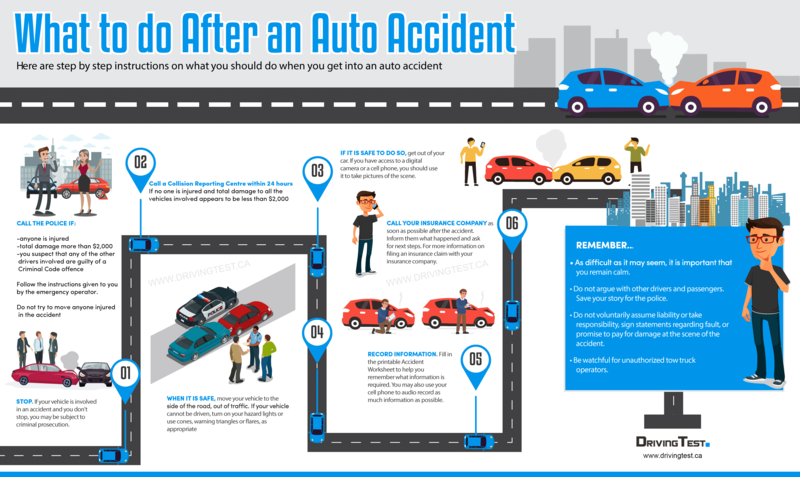 Below is a convenient and comprehensive list of the steps you should take if you ever find yourself in a car accident. No matter how minor the incident may seem, do not immediately leave the scene. If the police need to be called for any reason, you should stay on the scene until law enforcement arrives and releases you to go. If you leave the scene before it is acceptable to do so, you could possibly face criminal or civil charges. The first thing you want to do is make sure everyone in the vehicle is okay. Make sure everyone is conscious and not experiencing pain, especially back or neck pain. Don’t only check on those in your vehicle, but check on all passengers involved in the accident. If someone needs medical attention, do not try to treat their injuries yourself. You can apply a clean cloth and light pressure to stop the flow of blood, and you can do CPR to a passenger who has stopped breathing. Injured people who cannot move, don’t try to move them because you may do more harm than good. Call 911 and let medical professionals handle the injuries. After making sure everyone is okay and calling 911 if needed for injuries, walk around your car and inspect and assess the damage. If there is significant property damage, you will want to call the police and file a report. If the damage is significantly minor, such as a tiny scratch the size of a hangnail or a barely noticeable indentation, you may want to skip calling the police and settle things between you and the other driver. But only do this if there are no physical injuries and if both parties agree on settling this without assistance of the law. Right after an accident, emotions are high and the mind is usually swirling from the shock of it all. You may think you know what caused the accident, but there could be other factors involved that you’re not privy to. Because of this, don’t immediately admit to fault by saying things like, “I’m so sorry I ran that red light.” Usually, passersby and other bystanders will be at the scene, explaining their take on what happened. Talk to them and let them explain what they saw and heard so that you can see the bigger picture of what took place. Be mindful of your words because legal action can be taken against you if you verbally admit to guilt. While you are waiting on the police to arrive, it’s important that you exchange contact and insurance information with the other parties involved in the accident. You’ll want their first and last name, phone number, driver license number, license plate number, and their insurance information. It’s easier to get this information being kind and cooperative rather than angry and rude. Don’t assume that you can skip this step and just get the information from the police report. Sometimes, the police report does not include this information, so if you wait until later, you just might be out of luck. You will want to take pictures of the damage that has been done to your vehicle. If you can do this on-scene of the accident, that’s the best route to go. Pictures will help your insurance company determine the amount of damage that has been done to the vehicle so they will know how much compensation you need. Also, if this accident lands you in court, a picture is truly worth a thousand words. As soon as possible, you need to notify your insurance company of the auto accident. Give them accurate details about what caused the accident and who has been determined to be at fault. They may need to review the police report and/or view pictures of the damages. They will also need to know about any injuries that occurred to you and to the other parties involved. If you have the other party’s car insurance information, share that with your insurance company as well. Just because you didn’t end up with a bruise, broken limb or a laceration, this does not mean you’re in the clear. You need to set up a doctor’s appointment right away. Any time a car accident occurs, no matter how fast or slow the vehicles were going, force was involved. Your body will feel the effects of that force sometimes days, weeks, or even months later. Whenever you receive treatment or purchase prescription medication as a result of the accident, request copies and keep records of all of this in case it is needed in court. Also, these documents will serve as proof so that the other party’s insurance company can compensate you for medical expenses. If your insurance company has assessed the damage to your vehicle and you don’t agree with the determination, you can take your car to reputable body shops and get two other appraisals for comparison purposes. If their determination is much higher than what your insurance company is offering, you can appeal their decision. The same holds true if the other party’s insurance is doing the valuation. If the insurance company rejects your appeal, consider hiring an attorney. Also, never immediately settle for early settlement offers. Because some accident injuries don’t manifest until weeks or months after the incident, you will want to give your body enough time to present any other injuries so that you can get them confirmed and treated prior to signing the settlement document. Just because you’ve been in a car accident, it does not necessarily mean you need to hire an attorney. Depending on the severity of the accident and whether or not the insurance company is cooperating fairly with compensation, you may need to consult an auto collision attorney to make sure you’re getting the justice you deserve. Skilled auto collision attorneys don’t receive payment until you are compensated for damage to your car and for medical expenses.